Laguna Palcacocha is one of the larger of many glacial lakes in the Cordillera Blanca. It is located at approx. 4560 m asl. in the headwaters of the Cojup Valley, 23 km upstream of Huaraz. The lake has developed directly at the base of the still heavily glacierized Palcaraju and Pucaranra mountains. 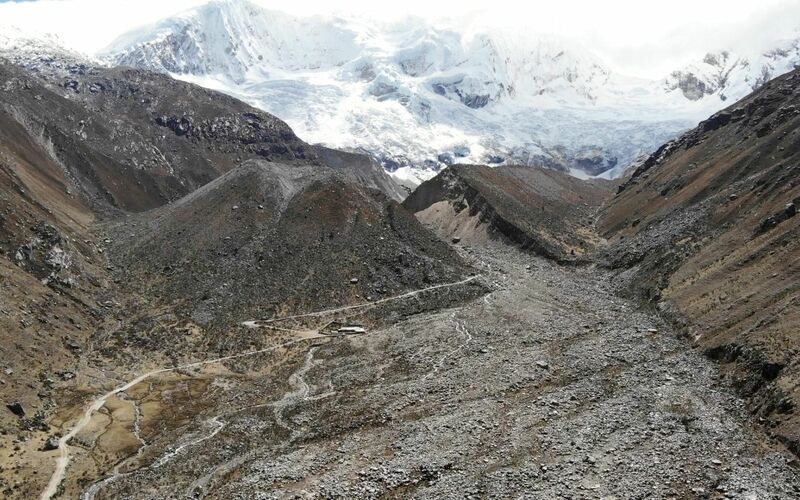 Since the 1980s, it has increased considerably in area and volume due to accelerated glacier retreat. The idyllic impression is, however, misleading: Laguna Palcacocha has made it all the way to a German court of justice, where it is the object of a startling case. Furthermore, it is not easily accessible to the public, as the access road is not only in bad condition, but also blocked by a gate. All this is the consequence of a long story which goes back to 1941, when the lake produced negative headlines for the first time. Laguna Palcacocha - a natural lake? You can explore the outlet of Lake Palcacocha by clicking on one of the arrows or by dragging the images. As you can recognize on these virtual reality photographs, the outlet of the lake is not at all natural, but has been modified by human. Which anthropogenic structures can you see in the images? To which aim were these structures and the corresponding measures designed? Which additional measures could be taken towards the same aim? Marco spends a lot of time at the Laguna Palcacocha. Let him talk about his activities here, and why they are so important. The early warning system Marco describes is only one part of the risk management strategy. Already in the 1970s, two artificial dams were built in order to stabilize the lake outlet in case of an impact wave. Siphons were installed in 2003 in order to lower the lake level and to ensure a larger freeboard. For the near future it is planned to construct a combination of an open channel and an artificial dam, so that the lake level can be further lowered and the consequences of a possible flood wave will be alleviated. You can change between different views by clicking on the arrows or dragging the photos, where possible. These photos show Laguna Palcacocha and its surroundings in 2017 and 2018. In 1941, the lake was much smaller. Most of its volume of approx. 17 million m³ is the consequence of accelerated glacial retreat since the 1980s. But how could the lake have looked like before 1941? In a first step, describe the the lake and its surroundings according to the photographs. In a second step, try to interpret the landforms and their relationships in terms of landscape history. The lake extends behind a large, horseshoe-shaped wall of debris, but only fills part of this depression. In the frontal part of the wall one can recognize a deep breach. The wall represents a system of terminal and lateral moraines formed during the Little Ice Age. Impounded by the moraines, a lake has developed in front of the retreating glacier. Originally, the lake level reached up to the top of the terminal moraine. In 1941, Lake Palcacocha drained suddenly for an unknown reason. A breach was eroded into the terminal moraine and the lake level decreased by approx. 50 m. Part of the eroded material was deposited directly downstream.